Flax Seed Oil is derived from flax seeds, which are slightly larger than sesame seeds and have a hard but smooth and shiny shell. Their color ranges from deep amber to reddish brown depending on the variety. Studies have shown that flax seeds are an excellent source of Omega-9 and Omega-3 essential fatty acids. They are also a very good source of dietary fiber and protein, as well as manganese, folate, Vitamin B6, magnesium, phosphorous, lecithin, zinc, and copper. In addition, flax seeds are concentrated in lignan, which has been shown to fight both breast cancer and colon cancer. Due to their hard shell, whole flax seeds are often ground in order to gain the full benefit of the nutrients contained within them. 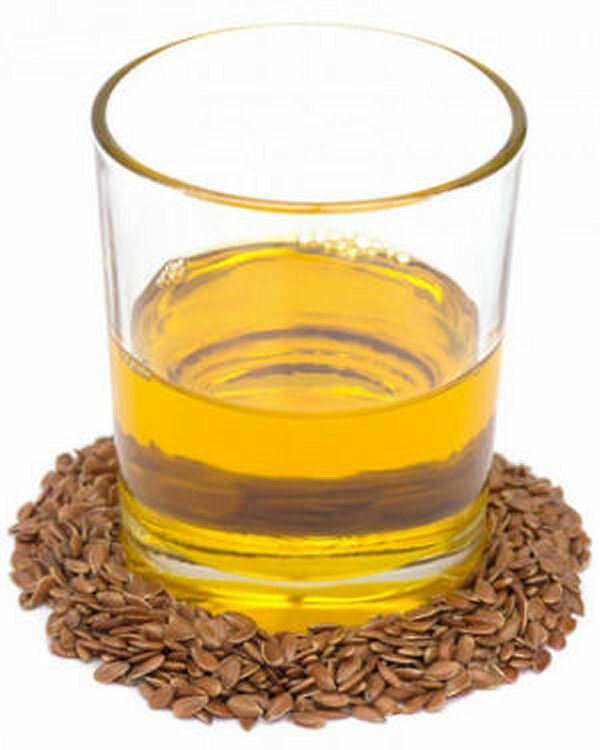 What are the Benefits of Flax Seed Oil? The lignan and fiber components of flax seed act as a highly effective laxative. To gain the best nutritional benefits of flax seed, always grind the fresh seeds. Take 3 tablespoons of flax seeds and grind them in regular coffee grinder. Add one tablespoon to a glass of warm water, and repeat this once in the morning, once in the afternoon, and once in the evening. Repeat this for 3 days. If symptoms don't go away after 3 days, consult your doctor since there may be some other cause of the constipation. Also remember to drink lots of water throughout the day when experiencing symptoms of constipation. Flax seed has been shown to relieve the symptoms of premenstrual syndrome. Simply take 1 teaspoon of flax seed oil three times daily for one month. Combine 4 oz. of cottage cheese with 1.5 oz. of flax seed oil and 1 oz. of milk into a blender. Add honey or fresh fruits to add sweetness. Blend this mixture and drink daily each morning. Some people experience increased flatulence or bloating when they first begin to incorporate flax seeds into their diet. Therefore, it is recommended that you start with a small amount, such as one teaspoon, and slowly build yourself up to your intake goal. When increasing fiber intake in the diet, it is also a good idea to increase fluid (water) consumption as well. Scientific studies have safely used up to 30 grams (1/4 cup) of flax seeds daily without side effects. Flaxseeds can be purchased in oil, capsule, seed, or powder form. Capsules are the most convenient form since they can simply be taken with a glass of water. However, since light and oxygen will slowly break down the essential fatty acids, it is important to purchase soft gel capsules that have a dark coating and come in amber-brown bottles. If flax seed oil is purchased instead of capsules, it is also important to store it in a cool, dry location. The shelf life for oil can also be extended by refrigerating it. A. Pan, D. Yu, W. Demark-Wahnefried. "Meta-analysis of the effects of flaxseed interventions on blood lipids". In American Journal of Clinical Nutrition. 2009;90(2):288-297. Flax seed oil is even better when taken with omega d 3 capsules. I damaged my rotator and broke my arm in 3 places. I went for therapy and everything got better. But then about 7 years later I began having severe pain in the shoulder - could not pick anything up and arm as well as everything felt just awful. The doctors said they could operate but couldn't guarantee anything and then I read about Flax Seed Oil. I cannot believe how much better I feel and whenever I quit taking Flax Seed Oil and Omega d3, I am right back into pain. Needless to say I no longer try to skip it. I love this article about Flaxseed oil, I want my Family and Friends to see this and try it. It works, I've used it for 4 years now for High Blood Pressure. It's good for lots of other health problems also. Thanks!